Custom Pop Up Banners are perfect for displays at special events, trade shows, and more! Make your brand stand out at tradeshows and events with these fill color banners that are well suited for both indoor and outdoor use. Banners are one of the most effective and cost effective forms of advertising. Apart from adding a blob of color and personality to the tradeshow booths and event venues, these impressive custom pop banners stand out easily even in crowded events which will make your brand the talk of the town literally! Shop from our collection of personalized Pop up Banners and avail the best prices, quick shipping and much more! 100% customer satisfaction guaranteed! Custom pop up banners have always been the middle name of tradeshow booth décor though it is equally popular as outdoor and portable advertising billboards. 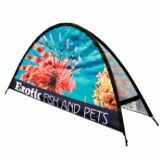 So, if you wish to make your brand stand out at easy rates, look no further than these colourful and attractive pop up banners. Easy to customize, put up and transport, this is the closest your brand can get into the eye-span of your audience. Available in various styles and dimensions, pop up banners can be set up in various layouts including backdrop and tabletop configurations. These can be printed with graphics, slogans or artwork to reach out to your target audience in a light hearted manner and to strike up an instant rapport. Personalized pop up banners are well suited for all types of fairs, conventions and mass events where you need something extraordinary to grab the attention of the crowd. Pop up banners can be used to share information, product details or special deals among others. Catch the attention of visitors with these attractive banners that will make your booth stand out from the rest of the crop. Gear up for a new phase in your branding by investing in these Personalized Pop Up Banners from TuffFlags. If you are not sure how to go about it, feel free to converse with our promotional consultants. Call us at our toll free number (888) 872-3524 or email us at customercare@tuffflags.com and our team will be happy to be of assistance to you.